Insurers need to become the home page for their customers. A home page is a source of meaningful, targeted and useful content that the customer seeks out. Technology can now deliver innovative solutions directly to insurance customers. Artificial Intelligence (AI) and Machine Learning (ML) are delivering targeted content continually from multiple sources, including data generated from IoT devices owned by customers, in real time. Focusing on the customer will make the relationship more valuable to the consumer, and will increase the number of interactions with the insurance company. Technology is making that happen from the point of first interaction. For example, when a potential customer interacts with a company’s website, or with an app powered by bots. Then the company uses AI to make sure the products are correctly matched and priced for the customer. As the needs of the customer changes, the enterprise delivers continuing, direct support. A survey by InsuranceNexus in June 2018, titled Insurance Customer Engagement Europe, 400 senior insurance executives were surveyed, 91 percent agreed that the insurance industry must become more customer-centric. 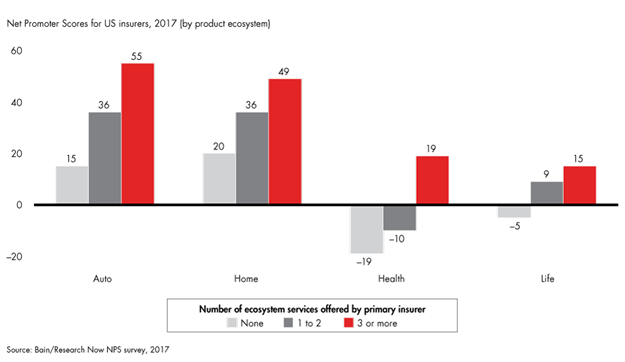 With that, Bain reports that insurance companies can boost revenues, improve margins and most importantly, sustain the loyalty of their very demanding customers. As shown in this graphic, “offering services beyond insurance leads to higher customer loyalty”. Top InsurTech influencers like Matteo Carbone, Dr. Robin Kiera, and Miguel Edwards (CIO at Kemper), are promoting these ideas at InsurTech events. At InsurTech Rising in Boston, Miguel Edwards used a real example of an insurance company selling pet insurance with a range of other services. Figo offers “your pet’s life in the palm of your hand.” It combines record management of medical, adoption/ownership, billing, and licenses/registration documents with tools that manage pet photos and social contacts, It also sells pet health insurance. The added value becomes the selling point to the consumer and a data collection point for risk assessment. The company offers free pet tags to identify lost pets. It also offers a GPS-enabled collar for real-time tracking (with text alerts) if a pet goes outside a preset area. Other services include health reminders, pet activities, and events, as well as pet social media connections. These additional services increase value to the customer and build brand loyalty. For the insurance industry, the key is to interact with customers, add value and build trust. The traditional behavior is that interaction occurs only when a customer buys a policy, and again when a claim occurs. Now an insurance company is a real-time risk evaluator and can prevent or mitigate claim events, and be a valuable data source that is important to the customer. Technology changes the process. Chat bots, driven by AI, direct customers to the most appropriate products and price the products based on the most current risk assessment. The customer interaction continues afterwards, IoT and telemetric data are used to adjust risk then alert customers of claim-generating events. Insurance industry leader, John Hancock, uses wearable devices connected to an application called Vitality. The company can offer discounts on life insurance policies based on the customer's activity as tracked by the Fitbit or Apple Watch. Vitality is also part of a health and wellness program with information on nutrition and active lifestyle choices. It is also used to promote the benefits of increased physical activities to its employees with a net increase in productivity, employee satisfaction, and reduction sick leave usage. The use of products like Vitality is becoming the norm for major employers to offer incentives to employees based on wearable device activity, from cash rewards to special recognition. Thought leaders in InsurTech are pushing the insurance industry to be more customer-focused. With the increased use of IoT data to track changes in risk, it gives insurers the opportunity to be more valuable to their customers. The use of AI at all levels of the insurance value chain will ensure customers are correctly matched with the right insurance products, and made aware of any gaps in coverage in real-time. Learn how to create personalized experiences for your customers by reading this overview on the Azure Bot Service and then create your first bot using the service.